An open ocean basin accepts more water input, which means there is potential for greater wave energy, making wave-dominated deltas more likely. High wave interference causes conflicted or deflected river mouths. There is less influence from fluvial sources. In wave-dominated delta regions, breaking waves cause immediate mixing of fresh and salt water. Typically, the fresh water flow velocity decelerates rapidly. A bar may form in the immediate vicinity of the distributary mouth, often supplemented by landward migrating swash bars. The wave action reworks the sediment, making it much sandier than other types of deltas, coarsening upward. Sediment is delivered by the river and is transported along the coast. The sediment is then deposited as beaches and bars and the development of distributaries is limited. Fine-grained sediment is carried offshore to form the subaqueous portions of the deltaic platform. These sediments commonly tend to be clean sand and gravel, often quite well sorted and abraded, containing high percentages of resistant minerals and rock types such as quartz, chert, and heavy minerals. The growth of a delta is influenced by the balance between the rate of erosion by marine processes and the rate of input of sediment by the river. Favored directions of wave approach can result in asymmetric beach ridges, and may cause the progradation of a spit across the river mouth. This results in channel flow oblique or parallel to the shore. Wave-dominated deltas can have various energies. When the delta is steep with high-energy, sediment-deficient coasts have negligible sand at their base and relatively deep water offshore. In low-gradient, low-energy deltas, the coasts are typically muddy with coastal fringe of wetland vegetation. In these deltas, incident wave action is dissipated over very shallow offshore gradients. More lobate and have smooth, arcuate to sharp margins. Longshore drift may rework sediment along coastline. Lobes strung out parallel to shoreline. 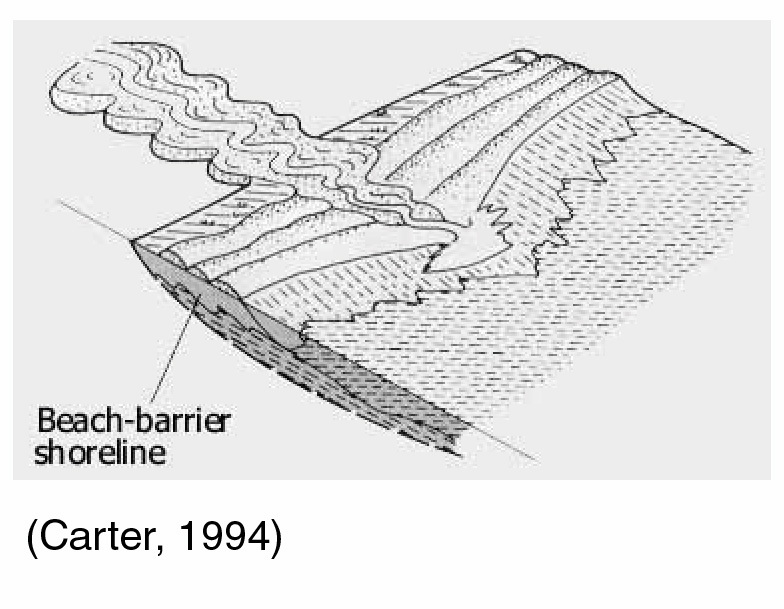 Sediment supply vs. accommodation volume: supply-dominated areas produce allochthonous shelves characterized by more rapid sedimentation and thick muddy sequences in which barrier sand bodies maybe encased while accommodation-dominated areas are associated with allochthonous shelves that have sandy sediments and experience extensive reworking. Distributaries cannot extend indefinitely into the ocean because the gradient and the capacity of the river to flow gradually decreases. The river is, therefore, eventually diverted to a new course, which has a higher gradient. This diversion usually happens during a flood. The river breaks through its natural levee, far inland from the active distributaries of the delta, and it develops a new course to the ocean. The new course shifts the site of sedimentation to a different area, and wave and current action attack the abandoned segment of the delta. The new and active delta builds seaward, developing distributaries and splays until it also is eventually abandoned, and another site for active sedimentation is formed. This delta begins to split into distributaries at Cairo, Egypt, more than 160 km inland, and fans out over the entire delta. Before the construction of the Aswan High Dam, the Nile's annual flood briefly covered much of the delta each year and deposited a thick layer of silty mud. In the past 3000 years, 3 m of sediment have accumulated near Memphis. Two of the large distributaries have built major lobes extending beyond the general front of the delta, but strong wave action in the Mediterranean redistributes the sediment at the front of the delta. The reworked sediment forms a series of curved barrier bars, which close off segments of the ocean to form lagoons. The lagoons in turn form a subenvironment, which soon becomes filled with fine sediment. Other wave-dominated deltas include Sao Francisco River of Brazil, Brazos of Texas, Senegal of western Africa, and Rhone of southeastern France.